The sharing of statuses, pictures, videos and links are what makes Facebook such a dynamic site. 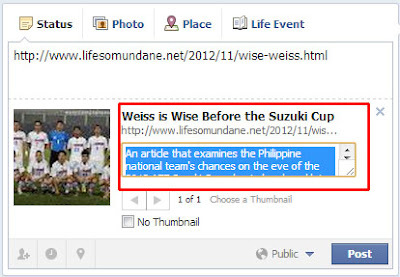 Shared links, in particular, compete with one another particularly if a Facebook user has thousands of friends, each sharing something interested discovered while surfing. To capture a user’s attention, Facebook conveniently extracts from the link itself strings of text which it then presents as a sort of description. This, along with a thumbnail also extracted from the same post, gives the user a preview of what the shared link is all about. First of all, Facebook checks the link for the page’s metatags (which you do not have to concern yourself with if you are not into web design). If Facebook finds none included in the published post, then it extracts the first string of text that it finds from the body of the post. Not all the time does Facebook extract the correct description, so that a shared link sometimes fails to attract the attention of potential readers. There is a way around this and this tutorial will describe it. The method is particularly useful for bloggers although is just as useful to everyone else who shares links from time to time. Please note the date of this article as Facebook is always making tweaks to its systems and this post may not be relevant after a period of time. Go to the form box either on your Home or Profile page where you share statuses, pictures or links. 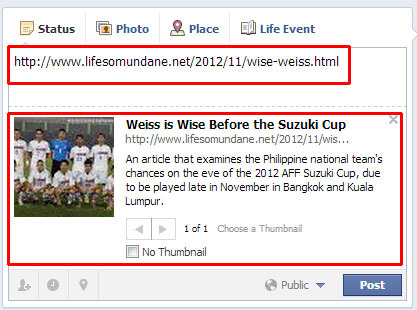 Type in or paste the URL or web address of the article or site that you wish to share. In this example, I am using a link from my web site Life So Mundane. Facebook automatically extracts the thumbnail and description. In this link, a description has been extracted because I use metatags on my web site. Hover your mouse’s arrowhead over the description that Facebook extracted. Notice that the entire string of text becomes highlighted in yellow. Click anywhere on the highlighted text. Notice that the text turns into a form box where you can type in your description. The former text turns into blue. 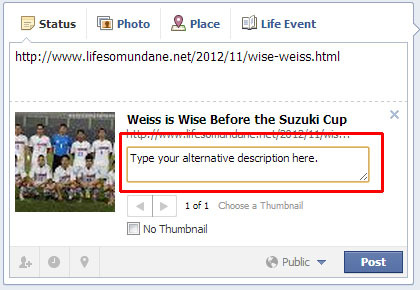 Type in whatever alternative description that you wish to accompany the link when you share it. 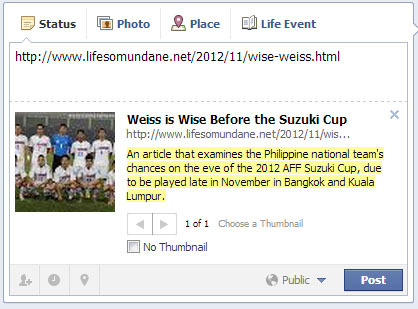 Click outside the form box when done and then click on the POST button to share the link. This description you typed will show across the NewsFeeds of your friends and will be archived by Facebook in what is called a permalink.